A full-time football and education programme which includes studying a BTEC in sports at Level One, Two or Three. Students train three days a week and have one match a week competing in the Under 19s FA National Youth League. Developing the students on the pitch the club links with the academy, playing against the U18s. Exceptionally talented players also have the potential to go on trial. With the added bonus of playing and training in the QPR kit, it all adds to the college academy experience. 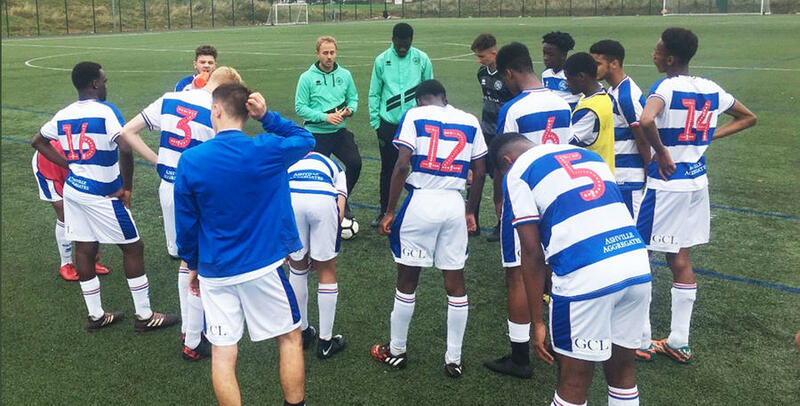 Off the pitch, the students have the opportunity to get their FA Level One coaching badge, work experience or University and American scholarship talks, while also being able to attend most of the QPR home matches. For more information please contact Danny Edwards via [email protected]. QPR Community Trust has teamed up with Harrow College to provide a football and education programme. Students can study a BTEC Level 1-3 sports qualification, whilst competing in competitive football, representing QPR in league and cup competitions. Other aspects of the programme include work experience opportunities, stadium events and access to match day tickets at QPR, plus much more. From 2019, QPR Community Trust will team up with Samurai Academy, to provide a football and education pathway in North Acton. With links to local non-league football clubs and opportunities for progression, this programme is open to all.